So obviously these cars are known for the famous torn leather seats. I have been doing research, but there aren't many RECENT threads that can help right now. I'm in the market to possibly buy some seat covers, or if it comes down to it I'll buy some EP3 seats or aftermarket ones.....maybe some cloth 05-06 ones. They're not all that easy to find locally though. Does anyone have any recommendations for seat covers? I've found a ton of good ones but they're mostly made for cars with detaching headrests.....the kind that this car doesn't have. I got the car a few months ago but the previous owner did not treat the leather at all. It was fully intact when I bought it, but one day I needed something from my glove compartment, and I tried to access it from the driver's side, stuck my knee on the seat, and it popped and tore a new hole in it. Check these out, different patterns and plenty of options. This is the brand of leather that old members on here used, they are still available. Says 02-04, but you can have it designed to match the pattern on 05/06 seats. What about recovering the seats completely? These guys are pretty cheap and if you search other forums for different makes and models they get pretty decent reviews. If i didnt find a set of 06 seats in near mint condition, i would have done this. Same here, if they looked good. For reference, I paid $600 for a set of mint black leather '06 front seats in 2017. 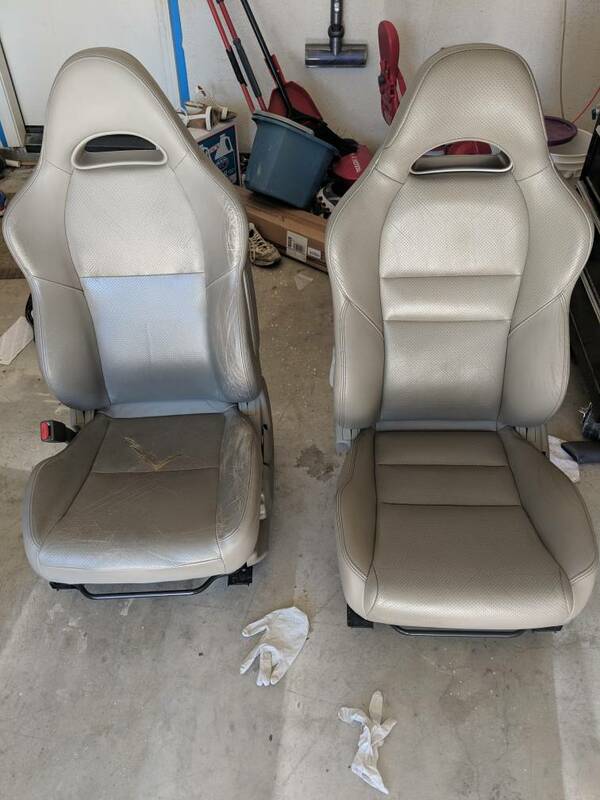 If anyone ends up getting the seat covers, post a pic so we can see how they look. I have never liked the look of seat covers on any vehicle I have ever owned. For $300, they would have to look like brand new OEM. For the OP, did you rip the leather or the seam? You might be able to get it repaired. I would go for restoring the seats, but I'm looking to get away from the leather completely. I prefer either cloth or removable cloth covers. I go to the gym a lot and leave sweaty so I hate the feeling on the leather when I leave. Plus its 100+ degrees here in the summer, and that black leather is unforgiving. So having removable mesh/cloth covers would be great as I can take them off and clean/wash them. It was only the seam, but like I said above, I'm really looking to get away from the leather. So covers or replacement seats seem the way to go. It's the black leathers that are hard to find. I gave my tan ones away for free, in similar condition to that pic. Not a bad deal for the parts you got though. Or, check the market place on this site. If you are patient, you will find whatever you need.